Printing for Fabrication provides attendees with a comprehensive view of transformative innovations in the print ecosystem, from printing techniques and their physics to evolutions in print machinery for 2D and 3D printing to advances in printing materials, as well as applications enabled by the interplay of all these fields. 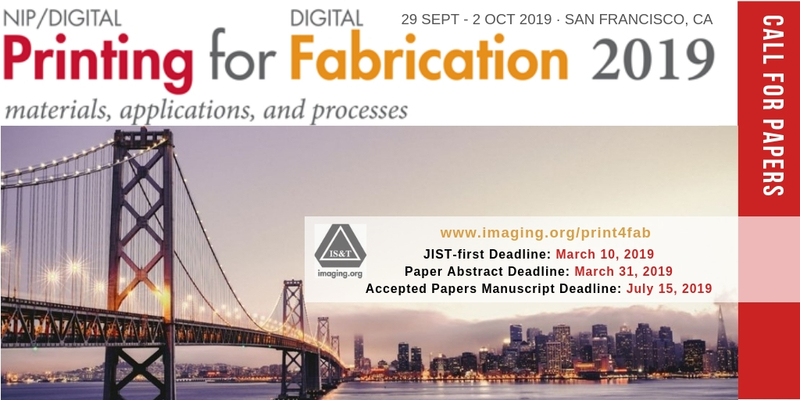 If you're involved in the cross-functional world of printing, submit your research findings and ideas that support the development and success of the next wave of innovations in the print ecosystem. Participants have the option of attending 2- to 4-hour short courses and workshops presented on a wide range of subjects related to digital printing technologies. In addition to course proposals, we encourage instructors/experts to offer location-based and application/industry-focused classes or workshops, as well as, classes with a hands-on, practical nature, and/or non-traditional format.